The final three flights of the programme took Apollo to new and worthy heights of exploration, science and discovery. 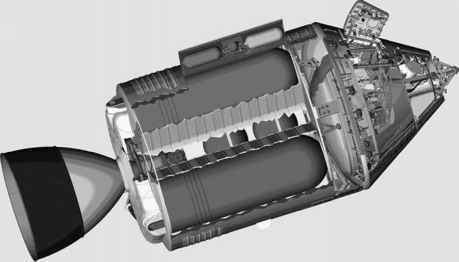 Since the engineering had been largely proved, science became the driving force behind choices made in landing sites and the equipment to be carried. Both the LM and CSM were upgraded to carry more supplies and increase their endurance. To further facilitate this final push for knowledge, a small fold-up electric car was carried on the side of the lunar module and a suite of sophisticated sensors and cameras were fitted into an empty bay of the service module. 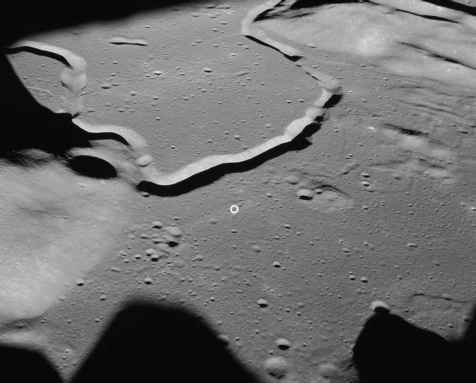 The Apollo 15 landing site (circled) next to the 1.5-km-wide Hadley Rille. where the story of the Moon's most ancient time began to be revealed. Apollo 15's launch from Earth on 26 July 1971, while as spectacular as any, gave no surprises. The coast to the Moon was punctuated by a fault in the main engine's control circuits and a leak in the CM's water supply, both of which were dealt with successfully. Once they had landed at Hadley Base, the crew of the LM Falcon, David Scott and Jim Irwin, depressurised the cabin to allow Scott to survey the site by poking his head out of the top hatch of the lander. The following three days saw the two explorers carry out a relentless programme of exploration that sampled the rocks of both the mare beneath them and the mountains beside them, while the mobility provided by their 'rover', and the ground-controlled TV camera that went with them, allowed an audience on Earth to share with them landscapes that Capcom Joe Allen described as The TV view along Hadley Rille ''absolutely unearthly''. described as ''absolutely unearthly''. The presence of the rover changed the rules of lunar exploration. Instead of working near the LM for the first part of a moonwalk, then going on an excursion, a rover-equipped crew jumped on board and made tracks as soon as they could so that, if it failed, they would have adequate reserves of oxygen to walk back to the safety of the LM. Their first excursion took them on a drive to where Hadley Rille ran below Mount Hadley Delta. Scott found driving the little vehicle somewhat sporty but both crewmen benefited from the rest gained while driving between stops. After their return to the LM, they set up a third ALSEP science station and Scott discovered the difficulties of drilling into the lunar soil when he endeavoured to emplace sensors for a heat-flow experiment. To the depth he drilled, the soil was an unconsolidated mass of powder and debris, but billions of years of time had compacted it as hard as rock, and there was no air to help to loosen it. The drill had to be redesigned. In their second excursion they drove up the lower slopes of Mount Hadley Delta, where they hoped to find fragments of the original lunar crust. Near a fresh crater, they picked up a candidate piece which the press instantly dubbed the 'Genesis Rock' because scientists told them that this sample would yield stories of the Moon's earliest era. Back at the LM, Scott battled once more with the balky drill to gain a core that was more than two metres long, but then found he could not extract it. By this time, the crew were far behind their planned timeline, and this led to their third moonwalk being shortened. On their final venture outside, and with Irwin's help, Scott finally extracted the deep core before they drove to the edge of Hadley Rille where they could see layers of lava exposed in the opposite wall. As a final flourish, this time in the name of science rather than golf, Scott carried out a simple experiment of dropping a hammer and a falcon feather simultaneously to prove the theories of Galileo and demonstrate that objects of differing mass fall at the same speed in the absence of air. While the surface crew redefined lunar surface exploration at Hadley, Alfred Worden operated the new cameras and instruments built into CSM Endeavour. As it orbited the Moon, large swathes of terrain were photographed with modified reconnaissance cameras, and the surface surveyed with instruments that could read the composition of the lunar material. A laser altimeter measured the varying elevation of the ground passing beneath, data which quickly demonstrated the relationship between the highlands and lowlands and, along with how their composition differed, yielded important clues about the Moon's history. Before they left for Earth, the crew deployed a subsatellite that continued taking measurements of the Moon's environment for seven months. The knowledge gained from Apollo was beginning to tell a story of an ocean of molten rock whose surface cooled to an aluminium-rich crust, and was later punctured by massive asteroid impacts whose wounds were later filled in as iron-rich lava welled up through deep fractures. It was a story that would also tell of Earth's earliest years.